Feng Shui is speaking a language of symbols. Piles of old stuff in the cabinets that are stored "just in case", "when I lose weight" and "just a shame to throw it away" is representing your inreadiness for something new, you just do not believe that life will bring you something more beautiful and more new. You need to understand this before you will start to make your amazing changes in the house. First of all, look around, think if you need this or that particular item or not, does it bring you any joy when you look at it or not. Maybe this thing is expired, unfashionable, or maybe it is reminding you about some unpleasant events in your life. That's it, for get about it, you do not need it anymore! You will need to thank this item happily and throw it away, if you still feel sorry for it, just give it to someone, who may need this item now. Doing this you could even say: "The old things are leaving me, the new things are on the way" or "I deserve all the best, thank you." So you will not feel the bitter of loss. In general, you must give up things easily, and believe that life will bring you something even better, have some trust. Remember about our beneficial "Qi" energy. If your house is stuffed with the old things, then it can not circulate properly, and thus, it can not bring into your home all those wonderful things, that you need. Dispose all unneeded items, disassemble stacks of paper in which you have no need long time ago, do not block the access of the "Qi" energy to your house. But this concerns first of all your own belongings. 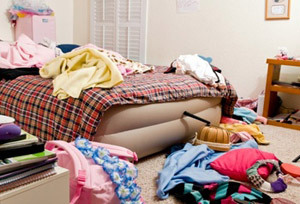 If you live with someone who does not want to change and he would be sorry to throw his things away - do not insist, do not turn your home into a battlefield. Leave this person, get busy with yourself and your own belongings. Keeping too much of an old things - is in the psychology of poverty and old age. You know, how hard it is for our grandparents to part with things. Well, let them keep their stuff, do not insist in this case. Now, wha t about the unwanted gifts? Someone will say that it is necessary to keep them. And the Feng Shui will tell you - no. If an item does not bring you joy and good feelings, if it is just lying around as a "useless gift", it is necessary to get rid of it, but in what way - it's up to you. It does not matter if you will give it to someone or just throw away. The main thing is that your house you have to fill only with those items that are bringing you happiness or they are simply useful. But to keep everything that comes in - is not worth it. There is no happiness and no use, when under your feet you will have a pile of useless things. 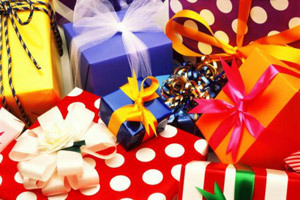 But in any case, do not worry about the unwanted gift and do not get mad. It is better to accept it with the sincere gratitude, and do with it whatever you wish. We should be grateful for everything, then our life will be full of joy and useful gifts. In the same time it is very good to "communicate" with the things, that are valuable to you - it's very useful, especially with the charms of Feng Shui. You can smile at your baby pictures, stroke your favorite mascot, affectionately wipe it off. Then your house will shine and will give you even more happiness. And another very important point. All that needs to be repaired, especially appliances, must be repaired or disposed. The same applies to the various spare details that our husbands are collecting for centuries, mostly "just in case." It is necessary to take a good long look at those spares - maybe you do not need them anymore, because the old bike or car was given away long time ago. But here you must be especially careful, because spares and tools are the "inner sanctum" of our husbands. Just be aware. If you can manage to get rid of the unnecessary things, that's great, if not, do not worry! Generally, the "big cleaning" is recommended twice a year, or at least once a year. Take a good long look at your closets and cabinets, once again rethink your wardrobe and say "goodbye" to the unnecessary things. It happens sometimes, that you just cleaned a couple of shelves in the closet, and already you feel joy and happiness in your heart. So let the clean and fresh flow of energy to come into your life and fill it with something new and wonderful!